Marshall Thompson, simply put, was a nice guy. He remained a nice guy until the day he died. He was also an incredibly talented actor and writer. In rapid succession, a youthful Marshall Thompson played roles in Homecoming and B.F.’s Daughter two outstanding film productions starring two of his most admired stars at the time, Clark Gable and Barbara Stanwyck. He was boyishly charming in his early work and was cast accordingly as the “boy next door.” It was the era of “studio stables” where careers were crafted for young contract players by their studios. At the age of nineteen, Thompson was dubbed by the MGM spinners as the “next Jimmy Stewart.” As hard a worker as you could find in Hollywood’s party-time town, Thompson began his career making 14 films in 2-1/2 years, although he now is best remembered for television roles. He was a favorite of the Hollywood press during the 1940s and 1950s and received excellent reviews for his films. He is, however, only politely documented for his film work by contemporary biographers. To date he is virtually unknown for his true callings: Marshall Thompson was a passionate citizen of the world, an animal conservationist, and a committed humanitarian. Born November 27, 1925, in Peoria, Illinois as James Marshall Thompson, he was the son of Dr. Laurence B. Thompson, the very image of a good man whose persona guided Marshall his entire life. His mother, Pauline Marshall, was a well-known concert singer who met Marshall’s dad while entertaining troops prior to their departure overseas in 1919. The senior Thompson was a decorated medic in World War I. Thompson was five years old when his parents moved to Southern California. His father became a prominent dentist managing a practice in Westwood Village, California for 30 years before retiring in 1959. Richard Whorf, about to direct Blonde Fever, saw a preview of Reckless Age and decided on the spot that Thompson was the juvenile he had been seeking. It was then that MGM signed Marshall to a long-term contract. Thompson’s career at Metro-Goldwyn-Mayer took off like a meteor in the 1940s. He made four films in 1944; another four films in 1945 including The Clock with Judy Garland; the highly regarded, Valley of Decision with Greer Garson and Gregory Peck; Twice Blessed with the popular Wilde Twins; and the role that caught everyone’s attention as the irrepressible “Snake” in They Were Expendable starring legends John Wayne and Robert Montgomery. Five films followed in 1946: Bad Bascomb shot in Wyoming with the master of expression, Wallace Beery and the soon to be legendary child star, Margaret O’Brien. This production was immediately followed by Cockeyed Miracle with Walter Pidgeon and Claudette Colbert. It was, however, Gallant Bess that landed Thompson a starring role for the studio and resulted in a nationwide promotional tour which rivaled the likes of any MGM had ever conducted. Thompson became a family name and female heart throb. It was an animal story and a heartwarming, true story of the Navy Seabees who found a horse they named Foxhole during the capture of the Solomon Islands. The horse became their lucky charm and pet. Playing Tex Barton, an orphan who tries to maintain his late father’s horse ranch, he loses his favorite horse during foaling just before Tex leaves for the Navy. But he finds “Foxhole” (named “Bess” in the film). Thompson became an avid horseman while filming Bad Bascomb but the Bess saga was a turning point for him when it came to his serious love of animals. Following the success of Bess he won increasingly larger and better roles. Also filmed in 1946 was The Secret Heart with June Allyson. 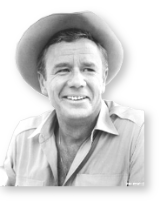 He played Joe Fisher in the Red Skelton film, The Show-Off. In 1947 he became Van Johnson’s barefoot friend in The Romance of Rosy Ridge. In 1948 he played one of the leads in MGM’s extravagant production of Words and Music starring Micky Rooney and Tom Drake, with cameo appearances made by every leading “musical” star at Metro. This was followed by another Clark Gable film, Command Decision, which reunited him with Van Johnson. In this film he played one of the great scenes in any career as Capt. George Washington Bellpepper Lee--a role sought after by every young talent at MGM - and he played it brilliantly. A change of leadership at Metro-Goldwyn-Mayer in 1949 had a stunning repercussion for Thompson: his contract was cancelled with no explanation. But he was quickly rehired as MGM prepared to film Battleground, one of the greatest war films ever made, and one that was far ahead of its time. Thompson played Private John Layton, an emotional and caring soldier posted in Europe during World War II. This was a remarkable film which told the story of our 101st Airborne Division in December of 1944. The Nazis had retreated to the forests of Belgium and Luxembourg and surrounded the U.S. Army in the town of Bastogne during what was later called the Battle of the Bulge. This movie chronicled the personal struggles and triumphs of this band of soldiers, showing a side of war that movie audiences had never seen before. The film technically starred John Hodiak and Van Johnson, but it was a true ensemble cast. Ricardo Montalban, with whom Marshall forged a lifelong friendship, as well as other pals Jerome Courtland, James Whitmore (later in life became a neighbor and friend), George Murphy, Don Taylor, Leon Ames and Richard Jaekel (with whom Thompson also became buddies) were the heart of the cast. The picture was nominated for many Academy Awards. MGM pushed hard to have James Whitmore and Thompson nominated for Best Supporting Actor. Whitmore got the nod. Thompson, unfortunately, came down with appendicitis during the filming, and his brief exit during the shoot meant many of his scenes went elsewhere. Still, he was the poster boy for the film’s advertisements as well as, the studio’s PR Department for the Academy selections. After Battleground a series of more mature roles followed: as the murder suspect in 1950s Mystery Street starring with his close friend Montalban; Devil’s Doorway and his first lead as anything but “the boy next door,” Dial 1119 for Murder. In Dial 1119 Thompson played a crazed killer who held a local bar and its guests hostage. It played to mixed reviews but became a classic noir film, along with Mystery Street and a series of other movies like My Six Convicts; two of sport’s bad-boy roles in The Basketball Fix and The Rose Bowl Story starring Vera Miles as his love interest and newcomer Natalie Wood. In 1955 he starred with his brother-in-law, Richard Long, in the melodrama, The Cult of the Cobra. Richard and Marshall had already formed a brother-like bond when Marshall married his sister, Barbara in 1949. Their courtship was like a storybook tale. Richard, Barbara, Roddy McDowell and his sister Virginia were traveling one afternoon back from a Photoplay photo shoot in Malibu, California. While driving down a foggy highway, a car crossed over into their lane hitting their vehicle head on. Richard was thrown from the car and only slightly injured. Roddy and his sister were both hurt but not seriously. Barbara was in the passenger seat up front, and the engine of the car burst through the dash board landing on her leg. She was the most seriously injured. This made headlines in the Los Angeles Times newspaper. A picture of Barbara caught Marshall’s eye. At the time, he was not a close pal of Roddy’s who was already famous in the Hollywood party circle for his poolside gatherings. Barbara healed quickly and resumed palling around with her brother. Marshall wrangled an invitation to one of Roddy’s pool soirées and there she was, relaxing in the sun. So began the relationship that tied the Long and Thompson families together. Barbara was an aspiring actress who, along with her girlfriend Judy, got her Equity card and went to Laguna Beach to do summer stock. Marshall followed her down there and also won roles at the Laguna Playhouse. In fact they were both in French Without Tears together. Barb’s best friend dated her older brother Robert Long and later married him. Marshall proposed to Barbara on July Fourth on the beach. Richard instantly became his best friend. And it was a grand friendship that lasted throughout their lives. Marshall, an only child, often said that when he married Barbara, he gained an instant family of brothers and a sister. To this day, anyone who knew Richard and Marshall in their later years figure they are up somewhere sipping a martini and playing poker with the best....preferably Red Dog. In the late 1950s he was off to Pinewood Studios in London where he made two films, It! The Terror form Beyond Space and The Secret Man. Successful films, these led to his first starring role in a television series. Up until now, he had done a number of excellent live dramas such as “Matinee Theater” and “Zane Grey Theater” and he felt most at home in the smaller confines of a sound stage. He was an excellent stage actor, having both a natural presence and a comfort in that venue. He was a line-memorizing wizard (just a glance over and he had it) and he had a easy grace and physicality in his performances. All of this transferred beautifully into the small screen. It began in 1959 with The World of Giants where he played Mel Hunter surrounded on the set by items and animals ten times his size. For this effort, huge sets were created and the scene was a virtual Disneyland to visitors. He continued to perform on many, many television series and live productions but took time out to star with Jeffery Hunter in No Man is an Island the true story of a soldier’s courage in a time of war. Altogether he did twelve war films. He was always a patriot and over this time he became a real student of war history. He produced, directed and starred in a Yank in Vietnam shot in 1962, the film had a delayed release in 1964. It was shot when the U.S. was still working as advisors in Viet Nam. Yet it was a dangerous shoot. Thompson had a price put out on his head by the Viet Cong for filming an anti-Viet Cong picture and was actually shot by one of his crewmen. The bullet hit his shirt pocket and deflected off a sterling silver lighter he had purchased in Saigon, grazing his shoulder. Not critically acclaimed, this picture did make movie history as the first production about this war filmed during the war and under fire. It was five years earlier, however, when Thompson’s life would change forever. He traveled to Africa for the first time in 1957 to film East of Kilimanjaro. There he met his first white hunter, had a close call with a white rhino and fell into a lifelong passion over this amazing country. He was never a fearful man; he would try anything. As with every film he ever made, he did his own stunts, whether riding a horse at full bore or wrestling a leopard in his hit TV show, Daktari. Africa cast a spell on him, and it was one that would never leave him for long. Daktari was a spin-off from Clarence the Cross-Eyed Lion, a movie in which he collaborated on the script and starred. Daktari was simply a gift for him to do. He was truly in his element. In 1966 he became a household favorite because of the series’ focus on family and animals. He worked closely with Ralph Helfer the owner of “Africa USA.” Helfer was a highly skilled animal trainer, and Thompson learned from him everything he could. All the animals used in the series and all the animals trained by Helfer were “love-schooled” from birth. To be a part of that set was a joy and an adventure every day. Daktari was ground-breaking in many ways. It was the first television series providing an ongoing platform of work for Black actors. It had wild animals as its stars, not horses and dogs. Ivan Tors was the show’s producer with a reputation for mass production of family fare. By the second season, Thompson insisted upon getting his hand in everything and the show improved in its reality and story lines. He did his own stunts, once again. There was one incident that almost cost him his life. The scene called for him to be in a pit with a leopard. Shot in the San Fernando Valley near Ventura, the animals, actors and crew worked in very hot temperatures. This scene was shot in the late afternoon. The leopard was hot. Her front paws were de-clawed, but she had all of her teeth. Like any performer after a long day at work in the heat, she got cranky and grabbed Thompson’s forearm with her mouth. Thompson did not react by pulling his arm away. He worked with the leopard’s movement until a sedative could be administered thus saving his arm. The cameras did not stop rolling during the incident and the scene was shown on air as it happened. The blood the audience saw was real and so were the 16 stitches it took to patch Marshall up. But he was back at work the next day. Thompson had another series prior to Daktari in 1960. The producer of I Love Lucy was looking for the ideal American husband to star with a French firebomb of a wife in a reversal of roles from Lucille Ball’s legendary series. Angel hit the air with great expectations and received good reviews but only lasted one season. After Daktari, Thompson began his focus on Africa and African wildlife preservation in earnest, sowing the seeds for a number of ventures with the many contacts he had made over the years. His writing efforts intensified, and he created both movie scripts and television documentary ideas. As it often happens in “the business” he got sidelined from these efforts when he filmed the movie George. It was a family adventure story about a New York City St. Bernard dog who is inherited by Jim (played by Thompson), an Air Canada pilot living in Switzerland. George, played by the very talented dog Monk, had never seen a blade of grass outside Central Park. The sight gags were abundant as this huge animal became acclimated to the Swiss Alps and the audience came along for the fun. The movie inspired a television series produced by Germany’s Telepool organization. It won a legion of admirers in Europe and Canada where Thompson had achieved legendary star status with fans via Daktari and promotional tours to hype the show. The series never played in the United States but can still be seen in re-runs overseas. Thompson’s life was again jeopardized by his desire to perform his own stunts. He was buried in a real avalanche during the filming and was rescued by his crew with special kudos to his Assistant Director Stefan, a Swiss skier who was an experienced stunt man and certified in rescue operations. Thompson’s last film of note was The Turning Point where he was called in at the last minute to replace Robert Donet as the love interest for Ann Bancroft. With little time to prepare, Thompson stepped in like the pro he was and gave a brief but strong performance in what had now been a reduced role. Thompson spent the bulk of the 1980’s in Africa. He created the internationally syndicated documentary called Orphans of the Wild which tells the story of Vivian J. Wilson. Wilson’s lifelong work in Zimbabwe was rescuing baby animals left alone in the wild, primarily by death of their mothers from poaching and hunters. The series still plays off and on in Europe. During this time he had at least five other projects in the works focusing on Africa, its people, its animals and its ongoing struggles with drought, famine and corruption. His efforts were cut very short. He died in 1992 of congestive heart failure. It is difficult to capsulate Thompson’s life. He made over 50 films and over 60 appearances on television. He loved the theater and made his Broadway debut in A Girl Can Tell with Janet Blair in the fall of 1953 and was active in regional theater through-out his career. He traveled back to Viet Nam in 1967 with the U.S.O to entertain troops and meet with servicemen personally. This journey had a tremendous impact on him. As he said, he was “humbled to the core of existence by the bravery, loyalty and dedication” he found in each individual serviceman he met. His focus in life was not on himself. It was never on becoming a “star.” His journey through films was his education and that is how he saw it all. It was a means for him to discover all things new and different. It was his adventure series. One of Thompson’s best performances was as “Johnson” in the 1955 film To Hell and Back starring Audie Murphy whom he respected immensely. His proudest moment was getting Orphans of the Wild on air, his saddest ones, no doubt, the death of his father and the loss of Richard Long. His most emotional, per my mom, was when they drove across country to Oklahoma University in Norman to deliver record albums and other vital possessions to me as I started my first year of college. After a “go get ‘em girl” lunch they left me sitting on the curb outside the restaurant to drive back to California. My dad cried two times in his life of which I am aware, when General Douglas Mac Arthur died and when he left me on that curb. His gift of words will always amaze me. His reverence of nature’s vast panoramas will always inspire. Marshall Thompson was a nice guy and, God knows, a good man.